Congratulations to SKY, the newest Hollyhock Bichon to attain his Champion title. Hollyhock Skywalker “Sky” was awarded his first major the first day he went in the show ring at 10 months old. He came home 3 months later finishing his Champion title with all his points from the puppy classes. 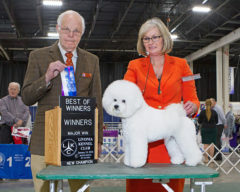 Thank you Ryan Wolfe and Lisa Bettis for taking this young boy on his initial journey into AKC competition. As a bonus, Sky brought home a few Grand Champion points and will be pursuing his GCH and International titles in 2018. Hoot! Hoot! Congratulations. Nice looking lad. Gokd job little mm an.